Deb's Cup of Tea: "Crowd Sourced"
I'm not sure if Oxford has added the title term to their venerable dictionary, yet, but I expect it to be added soon. If you aren't sure what it means, it means to turn to a wide variety of people to fund your endeavor. The "crowd", that's us, provides the money, the "source", to get something done. Crowd sourced things cover everything from movies to games to green projects. Kickstarter is, perhaps, the most familiar of places to find ideas, items and concepts asking for public donations to get them done. A few of my friends have posted to Facebook about Kickstarter campaigns to which they have contributed. They have been very interesting, ranging from a movie about the green girl in the original Star Trek, to a company making miniatures for use in gaming. I don't remember where I saw these. I've had the link in my email to remind me to blog about it. I think these are an absolute stitch. There are three sizes, small, medium and large. You can use them for dogs and cats. Use one for food and one for water. The best part is that the ceramicist is a cat rescuer and fosterer and will donate a dollar from each bowl sold toward either a cat or dog rescue. In the grand scheme of things, I need more cat food bowls like I need the flu. But, over the summer, Mija has developed these black spots in her chin. They don't seem tender to the touch, but she's not thrilled when I want to take a close look at them. They remind me, very much, of the acne Shakespeare had. He would get zits and then, in cleaning his chin, pop them which would cause all sorts of wounds and nastiness. 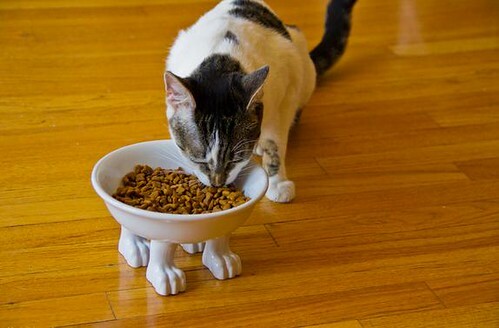 The vet suggested switching from plastic bowls to ceramic as they had seen this before. Once we switched, the acne went away. I have a couple of ceramic bowls and a couple of plastic ones. Once a week, I rotate the bowls so I need an extra set to have for when the current bowls are being washed. I could just go to the pet store and get a couple more ceramic bowls, but they wouldn't have character. I'm so about character. Plus, these have a gently sloping side. If you have pets, have you noticed them trying to get that last piece of food out of the junction between the side and bottom? There's not really a junction here. Every bit should be devoured. Uh oh. That means I'll really get yelled at when the dish is empty. I like that they are elevated, too. I think that will make it easier for the girls to eat from, particularly in the winter when the floor is chilly. I even thought about getting one just for me to use as a candy dish. Wouldn't that be cool? So, I followed this link, http://www.indiegogo.com/projects/chic-pet-bowls-fun-design-healthy-mealtimes-rescue-friendly, and checked out the site. You don't have to get anything back. Once you click the "contribute" button, you're taken into the donation part of the site and there is a spot to just donate money towards this. I want a couple of bowls, one for each gal. Plus, I like what she's doing so I rounded up my donation just because. This is the kind of thing I can support. I've searched through Kickstarter and not been touched by things I've found. Cat bowls hand made by a ceramicist who is also a cat rescuer and a foster mom? Yeah. I can get behind that. You're welcome to link to this blog post about this to spread the word. And, if you've got a bit of extra cash lying around, I hope you'll consider helping fund this project.